Dizzy is a 5 year old Miniature Schnauzer crossed with a King Charles and lives in Dorset. Dizzy was rescued 4 years ago by his current humans and since then he hasn’t looked back. He loves nothing more than being out and about socialising, whether it’s walks in the forest, the beach or out for tea and biscuits. He is a very sociable dog and is always on the go! Dizzy is also a sporty pup and a keen runner. He has taken part in several park run’s and races alongside his humans- bringing home the medals! Dizzy can be seen in his profile picture modelling the Chichester bow tie. Bruno is a super cute Westie living in East Grinstead. He is a very well travelled pooch having explored most of Europe. Very multinational! He is also a sunworshipper loving nothing more than a good sunbathe! Bruno hates playing fetch and the rain. Here he can be seen styling out our Anglesey Bow Tie Collar. Rupert is a 10 week old cavapoo (or cavadoodle!) who lives in London with his two humans Kelly and Danny. Rupert loves playing fetch and learning new things, he is already the master of 'sit'! He can be very cheeky and knows exactly what to do to get a reaction- in particular he loves to steal the slippers right off your feet giving his best head tilt when you call him back. Rupert is still discovering the world but he definitely doesn't like the hoover! Kizzy is a Polish Lowland Sheepdog who lives with her humans in Glasgow. In her photo she can be seen modelling the Siddington Bow Tie Collar which was bought for her to wear to her humans wedding. She doesn’t have many dislikes but isn't a fan of lettuce or seafood! Check out our latest Brand Ambassador- the fabulous Piper- a 2 and a half year old cockapoo living with her humans in Yorkshire! Piper is very special as in her spare time she is a Therapy dog doing great things. Pipers other interests include travelling, long walks and sitting on giant snow balls! Piper can be seen here looking very pretty camouflaging in the snow and modelling her Chelsea Bow Tie Collar. Harvey is a gorgeously fluffy 14 month old Pomeranian living with his humans in Edinburgh. He is a very active pooch loving nothing more than climbing mountains, playing with his friends in the park and long nature walks. He doesn't have many dislikes apart from his weekly bath! Harvey can be seen here looking very handsome modelling his Marple Bow Tie Collar from the Percy and Co. range. Dudley and Hank are 11 and 8 year old step brothers who live in London. Dudley is a bit grumpy sometimes and loves to hate his little brother. Hank enjoys following Dudley around and trying to annoy him! Hank ejoys watching TV particularly programmes with animals! Dudley loves cuddles with his humans and finding anything comfortable to lie on. Hank LOVES walkies- he gets very over excited and cries when he realises he is going for one. They are two peas in a pod and look fabulous in their Jesmond and Clifton Bow Tie Collars! Dexter is a Collie who lives in Hull with his humans. He can be seen here modelling his Beaufort Tweed Bow Tie Collar. He dislikes sneezes, clapping and the postman! Hobbes is a pedigree Welsh Springer Spaniel who lives in Loughborough. Some of his likes include nibbling on Raw carrots and chasing spiders. Being a typical gundog, he also LOVES chasing his ball and enjoys the odd swim! Hobbes can be seen modelling his Marple Collar from the Percy & Co. range. Doug and Bear are non biological brothers who live with their humans in Rotherham. Doug and Bear are both pugs and absolutely LOVE all food! They also love being centre of attention and getting lots of kisses and cuddles from their humans! Their dislike is the rain- they hate getting wet and refuse to go outside in bad weather! Far too cold! Doug and Bear can be seen modelling Anglesey Bow Ties. Mowgli is a Yorkshire Terrier who loves nothing more than snuggling up on the sofa with his humans. His favourite food is anything that isn't for dogs! He loves drinking coffee out of the cup when no one is looking, new toys and sitting on the back of the sofa looking out of the window and barking at people walking past! Mowgli dislikes loud noises, cats, bath time, the dreaded V-E-T and walking through long grass, it feels like being in the jungle! Mowgli can be seen modelling the Jesmond Super Hero Bow Tie. Bailey is an adopted 3-year-old French Bulldog who lives in Liverpool with her human, Naomi. Bailey is extremely affectionate and loves to be the centre of attention. She enjoys long naps, food and the occasional bit of yoga. In her free time Bailey likes going out for coffee and checking out local dog friendly eateries. She hates the dreaded v-e-t, the rain and being left alone. Bailey can be seen here modelling the Chelsea Bow. 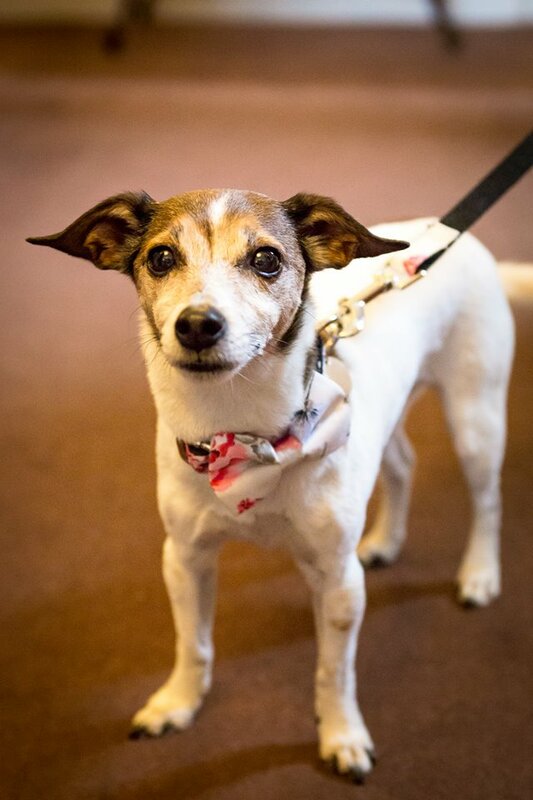 Pebbles is a Jack Russell crossed with a Chihuahua who lives in Herefordshire with her sister Poppy. They like to think of themselves as quite superior and are both spoilt rotten! In the image, Pebbles can be seen wearing the Disley Bow Tie and Lead set at her parents wedding! Their humans live as slaves to Poppy and Pebbles at their home and wait on their every whim! Lucky pooches! Lettice is a Working Cocker Spaniel who is country dog living by the seaside in Devon. She is a happy sociable doggy and has lots of friends- Theodore the Pheasant, Chicken the Chicken, Moo the Cow and Derek the Dragon to name a few! She knows all of them personally and if you call their names she can bring them to you individually – what a talented gundog!! Lettice really loves Babybels but gets quite upset when someone doesn’t share one with her. Lettice can be seen modelling the nautical Anglesey Bow Tie. Myla is a Pug crossed with a Jack Russell (Jug) living with her humans in London. She is a very active pooch and loves swimming, body boarding and bouncy balls! When she isn't running around, she enjoys roast chicken, sleeping under the duvet upside down, being centre of attention and people watching from cafes. Myla can be seen here modelling the Hampstead Bow Tie Collar. Teddy is a Cavapoo and lives with his humans in Halifax. You will often find him barking at his own reflection and running scared of cardboard boxes! Teddy can be seen modelling the Constantine Bow Tie. Basil is a one year old Cockapoo living with his humans in Richmond, Surrey. He turned 1 in May and is a very sweet natured dog always smiling. He isn't very good at sharing and hates being left alone but is super happy when his humans return! His skills include, but are not limited to, 'fetch' and ‘stay'. He is not very good at learning new tricks though as he is very easily distracted. In his mug shot he can be seen modelling the Jesmond Bow Tie and Lead set which suits him perfectly as a super-pooch! Dolly is a one year old Lhasa Poo who lives in Conwy, North Wales. She loves going out for adventures in the woodlands and for long walks along the beach where she can chase her ball! She enjoys meeting new people and playing with her favourite soft toy Raffa! Dolly has a stubborn streak and will certainly let you know if she doesn’t want to do something… however, she can usually be won round with a tasty treat! Here you can see Dolly modelling her Chelsea Bow and looking very cute and cuddly! 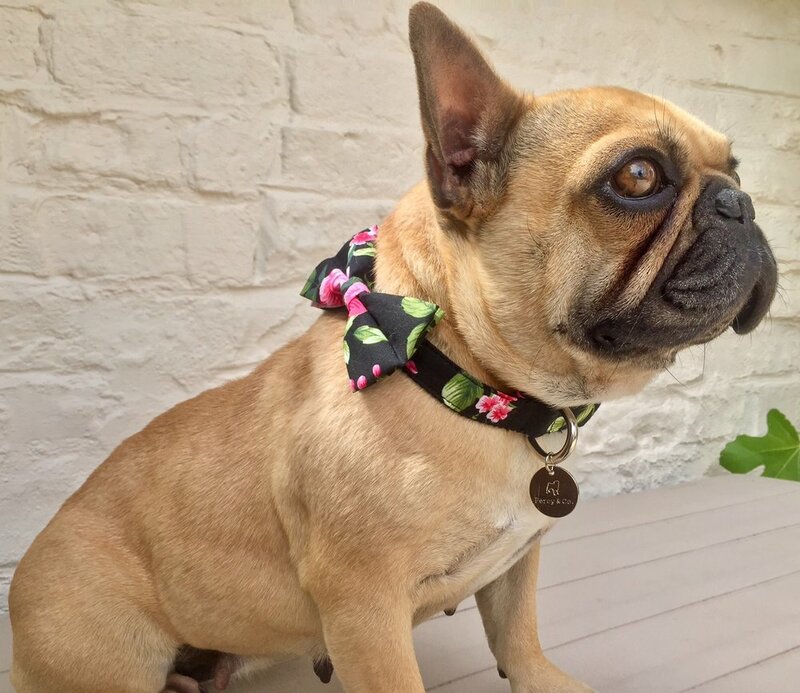 Henry is a very handsome Frenchie from London who can be seen wearing his Marple Bow Tie and looking very stylish! Henry loves nothing more than a good sunbathe! Henry also enjoys chasing squirrels, ducks and having a good wrestle with his friends- he is very strong and matcho! Archie is a bit of a scaredy cat at heart and fears include hosepipes, waves and stepping stones. Archie is a labradoodle and can be seen here modelling the Alderley Bow Tie with lots of tropical pineapples! Boo is beautiful Miniature Schnauzer who lives in Surrey. She is very playful and loves nothing more than a tug of war! Boo also enjoys carrying sticks around the countryside, 'peamutt' butter, tummy tickles and leisurely mornings stretching out! In her photo, she is modelling the Percy & Co. Chelsea Bow Tie Collar. What a beautiful lady she is! Archie and Agatha are two Norfolk terriers cross Jack Russells who live at the seaside. Chosen to be brand ambassadors thanks to their love of life. In their photo they can be seen modelling the Anglesey Collar and the Disley Collar. Archie likes long walks on the beach and dislikes squirrels. Agatha dislikes other doggies stealing her toys but loves cuddles and popcorn. Percy is the original brand ambassador. Not only the face of Percy and Co. but also a fantastic model. In his passport photo he can be seen wearing The Constantine Collar. Percy enjoys long walks in the park and sitting next to the fire. He dislikes postmen and cats.